I had to pop to the shops to pick up a few essentials (read cotton wool and mailing bags), but decided to nip into TK Maxx for a quick browse. 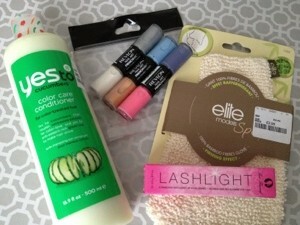 This lead to other shopping and before you know it, a little haul was born. So what did I buy? TK Maxx was full of goodies today. They had several sets of Revlon Nail Art pens, with each bag containing 3 double ended polishes. I chose one with a nice mix of brights and pastel polishes, and this was a bargain £4.99. As I've not tried anything by Yes to before, I decided to try their colour care conditioner. Although I don't have coloured hair, I thought it would be quite good for moisturising my dry ends, and at £3.99 for a massive 500ml bottle, this was really good value. I also picked up a bamboo exfoliating glove for £2.99 and last but not least, a Too Faced mascara. I was a bit intrigued by this as the wand contains a light (total gimmick I know). However I got home and tried to have a play with it, but the wand has somehow snapped inside the tube so this is going back for a refund. 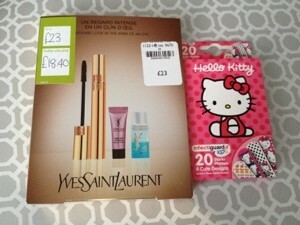 Next on the list was Debenhams, as I had a £5 reward to spend on my beauty card. I decided to repurchase the YSL faux cils mascara as they had 15% off this little gift set, meaning I got my mascara, plus a mini serum and eye makeup remover for just over £13. I also found these cute Hello Kitty plasters in Poundland whilst hunting for my mailing bags and couldn't resist them (they're for me, I don't have kids!). Last but not least was a quick visit to New Look. 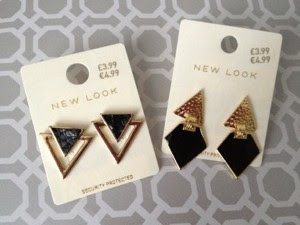 All of their jewellery and hair accessories are buy one get one free at the minute, so I managed to get two gorgeous pairs of earrings and two necklaces for £12. What's your favourite thing from my weekend haul? 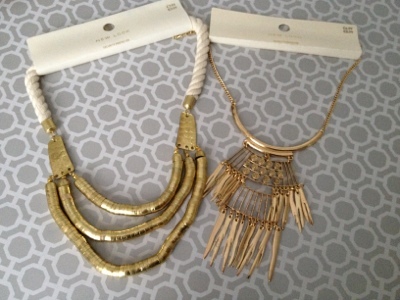 Those earrings are gorgeous! I wish I could pull them off. Looks like you picked up some great bargains too, I never knew TK Maxx stocked the Yes To range, will have to check it out! Oh I love TK Maxx. I saw lots of nice Revlon varnishes there last time but didn't see the pens. Will have to take a look again. Thats an absolute barg for the YSL mascara. I just paid £10 for a L'oreal one that I am not even that happy with! I *need* some of those Revlon polishes. Can't believe you found them in TK Maxx?! They are soo expensive in Boots.